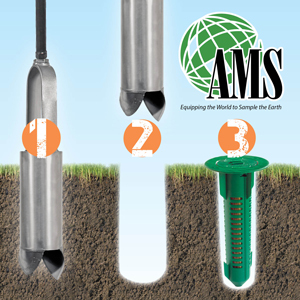 Use AMS augers to dig holes that fit most termite bait stations. Their bits and cutting heads help pull the auger into the ground with each twist of their handle. Regular augers are used in most soil conditions; mud augers are designed for moist and sticky soils. Dutch augers will help you get through heavily rooted areas, while open-faced augers feature an aggressive cutting head for muds, clays and hard soils. AMS’ one-piece open-faced auger has a total length of 52 in.